I’ve always imagined motorcycle designers to be technicians in white lab coats. 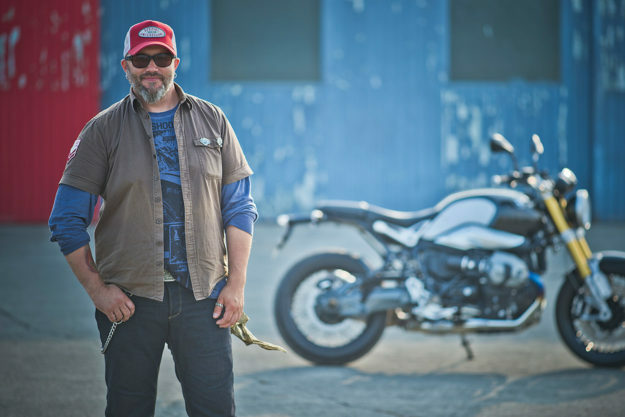 So I was surprised to discover that Indian Motorcycles’ Director of Product Design is a freewheeling Swede with a passion for old-school choppers. 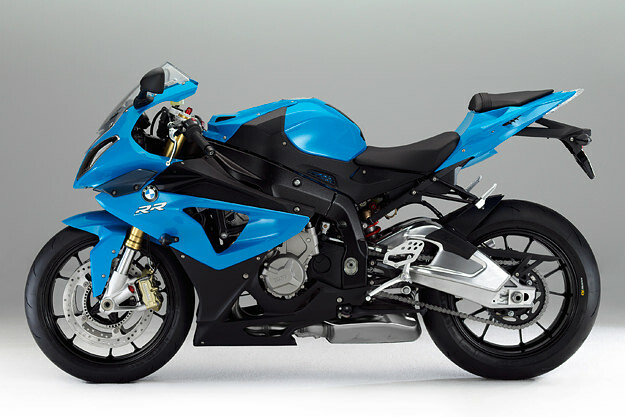 At BMW, Stenegärd’s portfolio included the smash hit BMW R nineT (above), the HP2 Sport and the S1000RR, the superbike that gave the Japanese ‘Big Four’ serious headaches. We gave him a headache too—with the traditional ten questions of the Bike EXIF interview. What was the first motorcycle you bought with your own money? I consumed a whole bunch of bikes before I turned 18—from Hondas to Kawasakis, 125s to 350s. I cut them up and transformed them into cafe racers or bobbers. All were reckless acts of youthful bravado, and I can’t remember actually paying for them. The first ‘big’ bike I bought was a 1970 Triumph Trophy 650, a 70s-style chop. I had just turned 18. Today it would be pure hippie glory, but back then, it was nasty as sin. It had a coffin tank, a 6”-over fork (with no rake) and a white banana seat. The next winter, I turned it into a long fork chopper, Swedish style. Did all the work myself, and sketching it all out. It was a great learning experience. My school grades went way down south, but I was rolling! What do you think is the most beautiful production motorcycle ever built? Crocker. No, Britten. 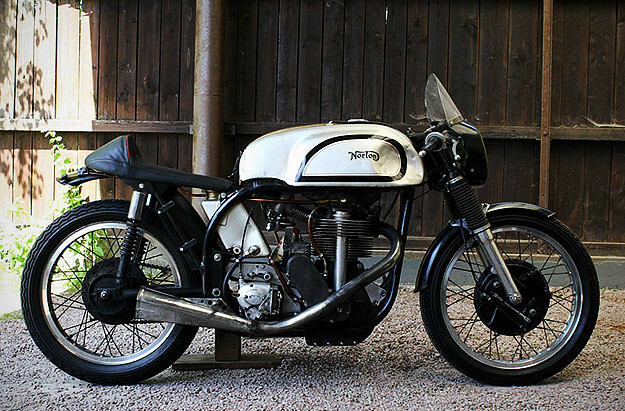 Wait—Norton Manx (above). Or maybe Husqvarna GP 500. This is a hard one, like asking, “Would you pick Lemmy before God?” How do you answer that? Lemmy is God! 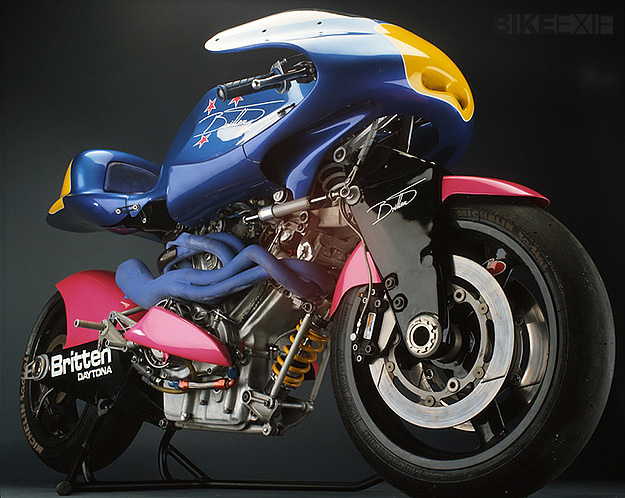 But I’ll stick with Britten (below) for now: I saw the first live one, the number 8 bike, in a small Triumph shop in Nor Cal. That must be some ten years ago now, and I could not believe it—I didn’t know the bike was gonna be there. I was in the shop looking for a head gasket for my Triton, and there it was—just casually sitting by the entrance on a paddock stand. Just like that. I fell to my knees in awe. What a machine, what a moment! There is just nothing like it. Such an extraordinary two-wheeled mechanical exploit of dazzling splendor. What motorcycle do you despise? None. There is no bike out there that a good blowtorch, angle grinder and TIG welder can’t fix. What is your idea of perfect happiness? Top of the list is hanging out with my two sons at some dusty motocross track, or with my daughter in the horse paddock. Family time—any time, any day. But when it comes to motorcycles, it’s after I’ve spent years on a project and can finally start the bike up and take it out for the first spin. That feeling is just golden. Religious. Trips my trigger every time. This mechanical creature you‘ve been working on for so long … I will never forget the first tests at BMW with the HP2 Sport and the S1000RR (below). You are just so pumped. Heart beating and butterflies. All the teamwork, great engineers and passionate test riders. The sketches and loops on the clay-model flash before your eyes when you ride. It was the same thing when I fired up my “Forsaken” Shovelhead two years ago: riding the result of endless hours in the garage. Remembering how you filed every weld and bracket. The cut fingers and dirty hands. Old motor oil and shavings from the lathe. The smell of the TIG. I love it every time. Electric motorcycles: Yes or No? Hell yeah! Two wheels with any motor and you are guaranteed to have fun. What is your favorite journey? I’ve got two, a Dr Jekyll and Mr Hyde kinda thing. Number one is going to the legendary Norrtälje Custom Bike Show with my club, Plebs Choppers. We gather on a Saturday morning, have breakfast, and get the bikes cleaned and polished before hitting the road. It’s usually about 15 to 20 bikes. After a couple of miles of hooligan riding through Stockholm suburbs, we finally head north on a beautiful backroad going from Stockholm to Norrtälje. It’s just such a relaxed ride, hanging out with your buddies on the road. 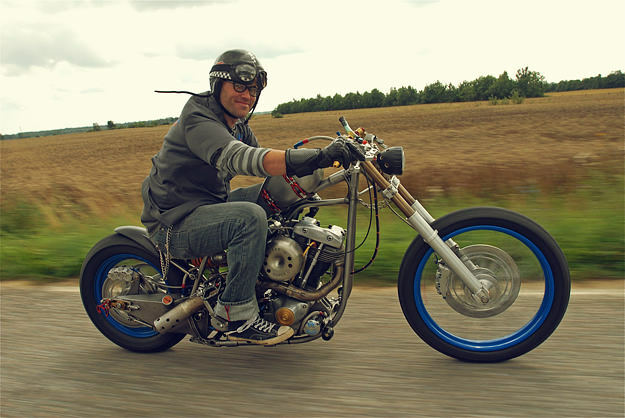 All on home-built bikes—choppers, bobbers, café racers, all open pipes. The sun reflecting off polished aluminum. It’s a pure experience, in Stereophonic Exhaust Sound and Kandyapple Metalflake Kolor. 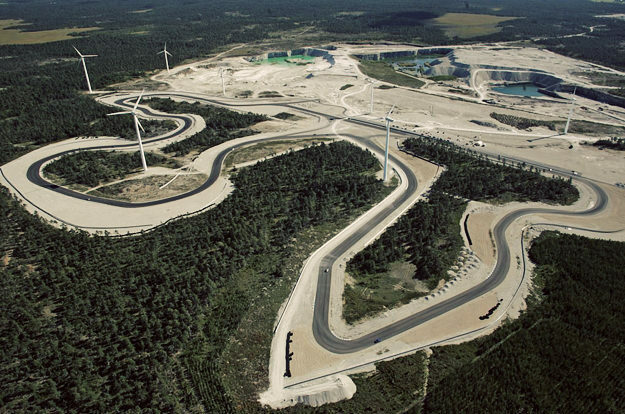 Number two is doing 3.2 kilometers, lap after lap, at the Gotland Ring racetrack—my home track (below). Chasing that perfect line, preferably on an S1000RR. Perfect bike, perfect track … hitting the straight hard. Braking too late. Somehow you make it. Maxed out lean angle, but you’re still not fast enough. Traction control working hard. Such a trip, constantly over 10,000 rpm, lap after lap. The sound, the smell, the wind. A helluva journey! Which ‘everyday’ modern bikes do you think will become future classics? The equivalent of the Honda CB750 or Moto Guzzi V7 Sport, if you like? There are so many in my book. 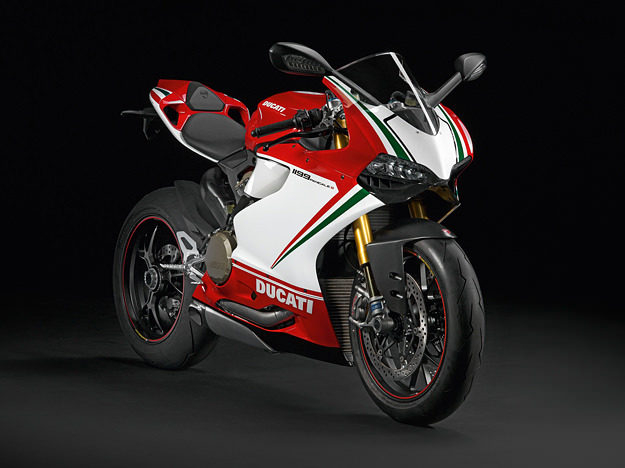 But fresh home from Milano and the EICMA show I would say the Ducati Panigale (below). A milestone. Amazing bike, amazing concept. Respect! Who are your real-life motorcycling heroes? I grew up with several on my wall, all Swedes. And they are still my heroes. One is Acke Rising of ISR Brakes. He has been in the business since forever, constantly pushing the envelope, coming up with new concepts and technical solutions. Faster, lighter, better. 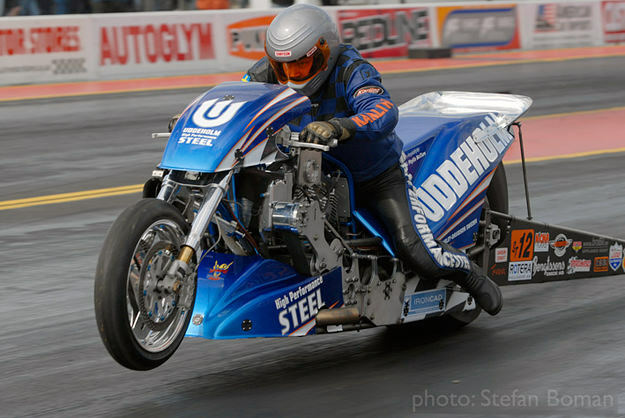 The second is Anders ‘Charley’ Karling (below), the four-time European Champion in Super Twin drag racing. Any guy who builds his own motors (including turning and hardening his own roller bearings for the crank), pushing 1000 hp on nitro methane, is positively nuts in my book. 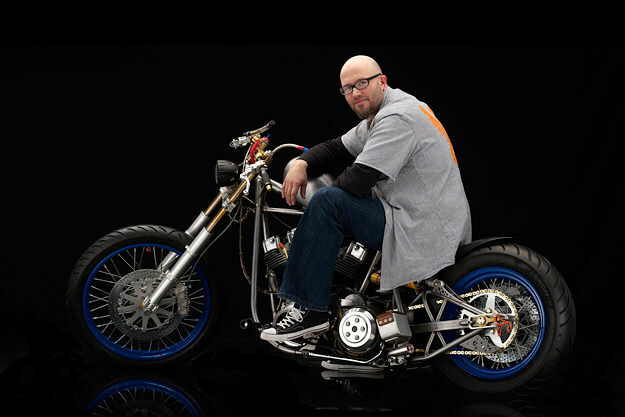 Gordon Rooth of Unique Custom Cycles is another. I saw his first chopper back in the Swedish magazine Colorod, in 1982 I think. I was just a kid. It just looked sooo cool! He also worked with Jesse James back in the early days of WCC. And he still builds kickass bikes. Never missed a beat. On the race side it’s gotta be Per-Olof ‘Posa’ Serenius, the ice speedway racer. He’s 63 years old and still going strong, and won his last World Championship in 2002. Check out Bengt Löfgren’s movie Icy Riders. Are you optimistic for the future of motorcycling? When I see all the boys and girls at the motocross track, the hoards of scooter kids doing stunts in the city, and all the young guys getting into old school bikes and café racers, getting their hands dirty … then the answer is yes. What is your current state of mind? I’m in a painting state of mind. Every year, I create a poster to help some buddies out. It’s one of my few chances these days to have proper fun with a pencil and brush: my work is more about management now. I have a great creative team to lead, at a great company where everyone is passionate about motorcycles. But I do miss sketching and drawing sometimes.